This isn’t the first time I’ve talked about packing lunches. 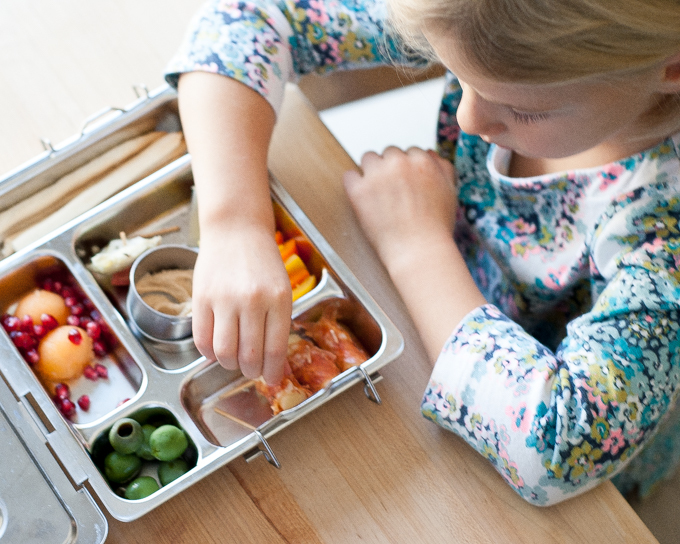 Earlier this fall I gave you a week’s worth of easy, healthy lunchbox ideas using a metal compartmentalized lunchbox (this is another similar one), and today I’m sharing another way I keep lunch packing interesting and easy. I’m a big fan of themed lunches. 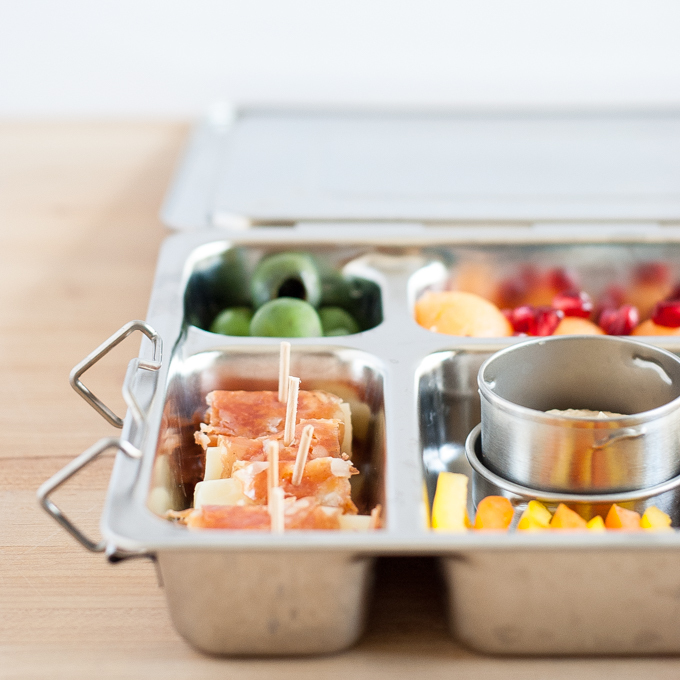 While it may sound complicated, I find it helps me almost instantly come up with a whole bunch of ideas for what I can use to fill those little compartments in the metal lunchbox I usually use for my girls’ lunches. I buy most of the items pre-made and just need to do a little assembly to put it all together. 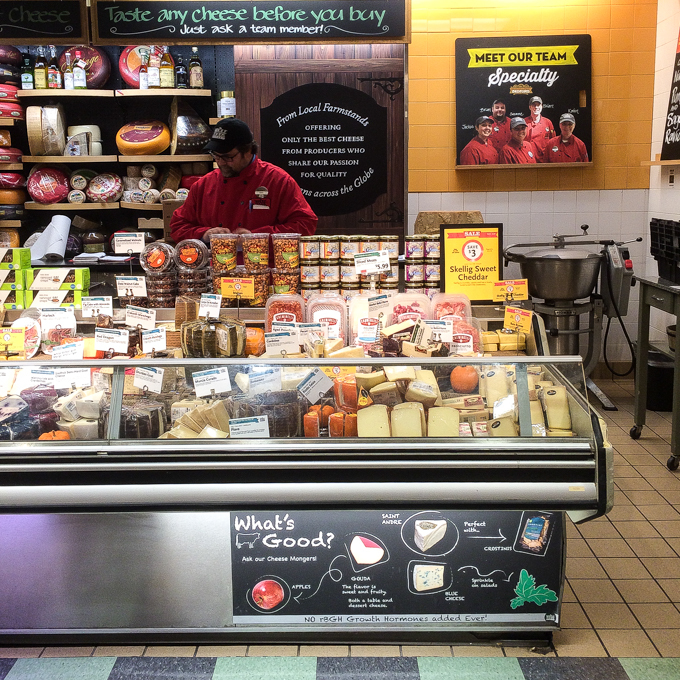 Whole Foods is my favorite store to grab these pre-made items…and if I’m being honest, it’s my favorite store to grab anything. I have suspected for some time that they pump oxygen into the air because I just feel amazing every time I’m there. One of my girls’ favorite themed lunches is a sushi box. I toss pumpkin seeds with a little soy sauce (soooo delicious, one of my favorite snacks! 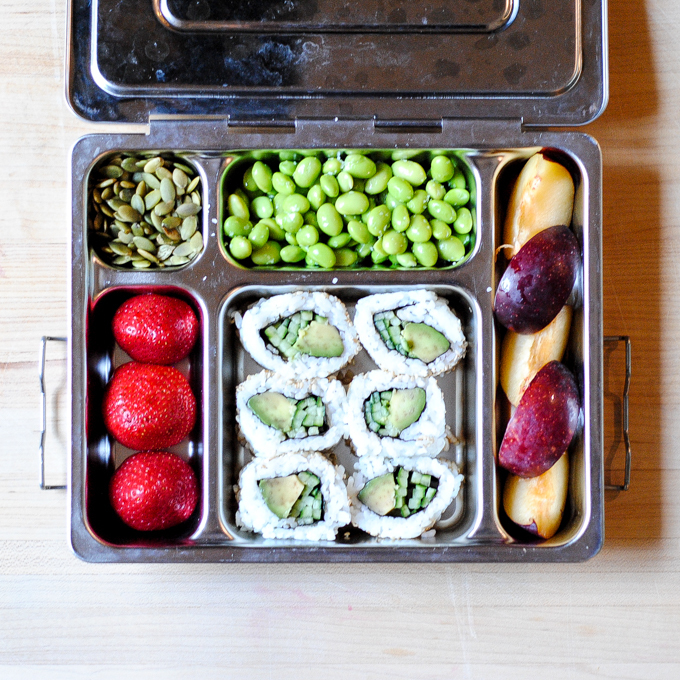 ), include shelled edamame, pre-made cucumber avocado sushi, and some fruit (strawberries and plum slices pictured here). 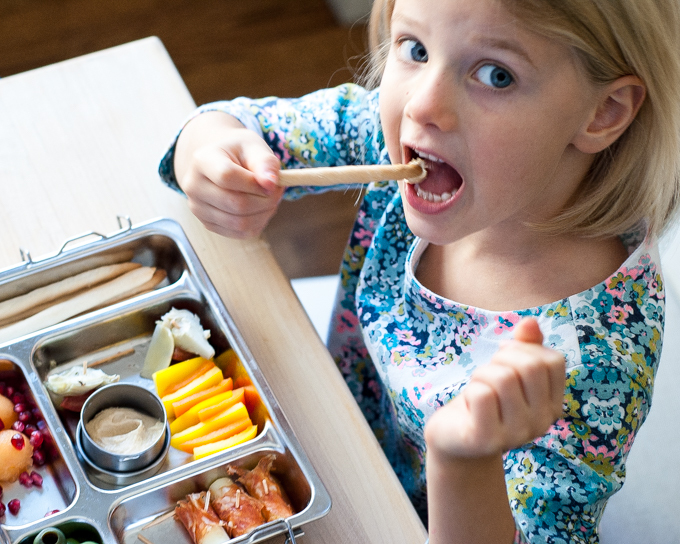 It takes minutes to throw this together and it’s healthy, beautiful, and my girls get so excited when they open up their lunchboxes and find this inside. Everyone eats with their eyes first, children included, and I think a colorful, pretty lunch appeals to a lot of kids because they like the way it looks. Plus rainbow colors in your food usually mean there’s a good mix of nutrients. 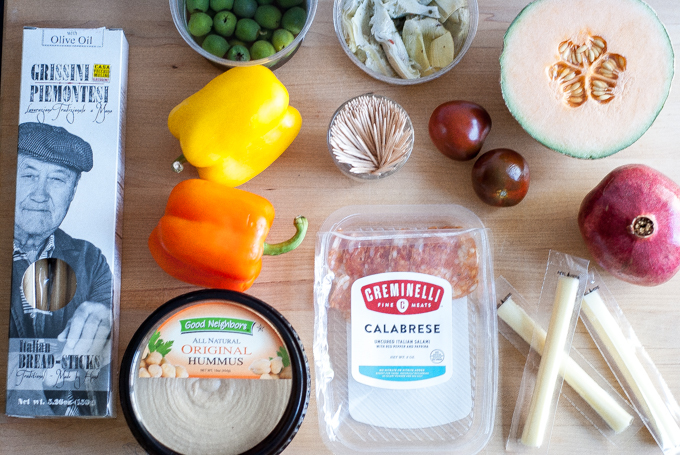 Another one of their favorites is an Italian antipasto box. 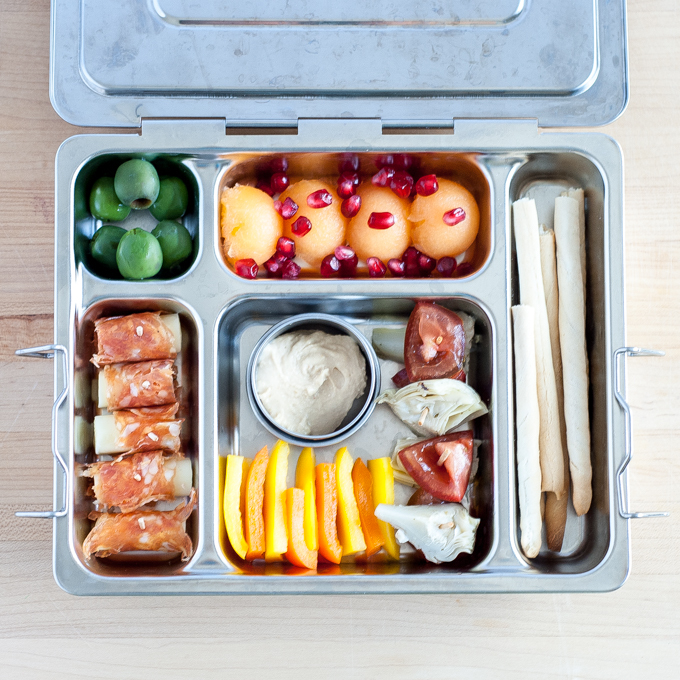 I gather up mostly pre-made components just like with the sushi box – breadsticks, green olives and marinated artichokes from Whole Foods’ antipasto bar, tomatoes, fruit (cantaloupe and pomegranate here), mozzarella cheese sticks, Creminelli salami, hummus, and peppers. Then I portion it all out into the metal lunchbox. My girls like to dip their peppers and breadsticks in the hummus, which I pack in a little leakproof lidded container that fits right inside the lunchbox. I cut toothpicks in half and use them to make mini tomato artichoke skewers. I swear, my girls will eat anything if it’s on a mini skewer! I also wrap the salami around pieces of the string cheese and use the toothpicks to hold them together. These salami and cheese pieces are definitely my girls’ favorite part of this lunchbox. I only recently found Creminelli meats and they are just the best quality. Nothing artificial, no fillers, no nitrates. Just simple and delicious. I found them pre-sliced in the cheese department at my local Whole Foods. Most kids love cured meats like this so I have been keeping a package or two on hand every week. My girls practically beg for the salami for snacks too. It’s a great way to work in a little protein with some fruit at snack time. These cuisine-themed lunches really help simplify the thought process of putting lunches together – if you’re struggling to find new idea, give it a try and see how it works for you. Start by thinking of a cuisine your children like – Mexican, Chinese, Japanese, Italian, etc. – and then from there think about their favorite things within those cuisines. I think you’ll be surprised how easy it comes together from there. And there isn’t much that makes me happier than getting an empty lunchbox returned home to me at the end of the day! 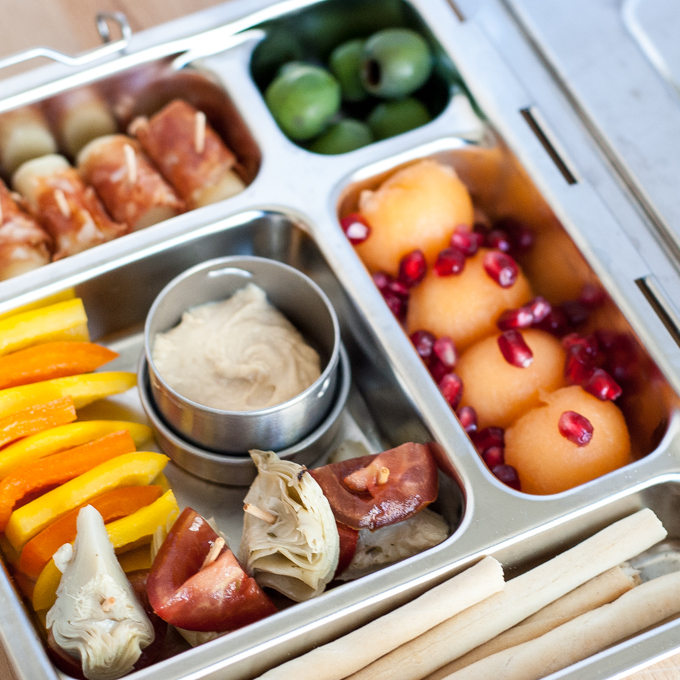 What’s your favorite way to pack school lunches? Do you have any tricks up your sleeve to break out of the sandwich rut? Share them in the comments below, I am always looking for new lunch ideas! 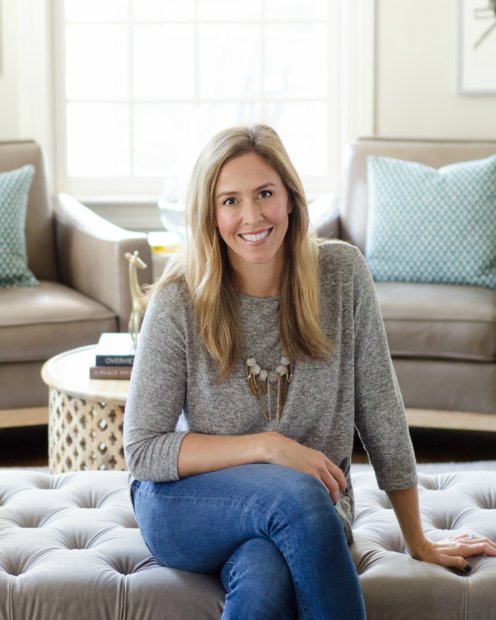 Thank you to Collective Bias, Creminelli, and Whole Foods for sponsoring this post. 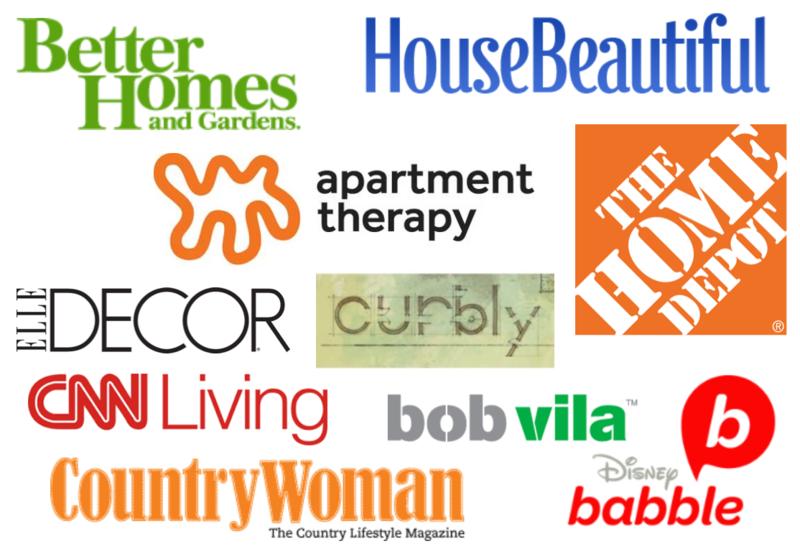 I only share companies and products I genuinely support and would share with you anyway. All ideas and opinions expressed are sincere and my own, as always.